Paul Larudee, the co-founder of Free Palestine Movement and one of the leading Pro-Palestinian activists in America, posted the following text on Al Awda list. It seems as if BDS has given up on the most essential Palestinian principles. While BDS was initially defined as opposition to colonisation of all Arab land, the current BDS statement merely opposes only the colonisation of Arab land occupied in 1967. The following text raises serious questions. Perhaps one of our readers can provide the answers. It is with great sadness that I must propose withdrawal of al-Awda endorsement from the BDS Campaign led by the BNC until the change in its mission statement has been corrected and until a public explanation is provided for the reasons for the change as well as the procedure by which the change was implemented. A more transparent public explanation of BNC finances is also recommended. Obviously, this is not a proposal to stop boycott, divestment and sanctions. However, BDS actions and practices do not require endorsement of a particular movement. Everything that undermines the racist Zionist state deserves our support. Nevertheless, under no circumstances can we support any statement or action that legitimates such a state, which is the problem with the BNC-led BDS Campaign. When did this wording change? By what procedure was it amended? Were endorsers like al-Awda consulted or even notified about the change? What was the reason for the change? 1. When did the wording change? Sorry, but I have no idea about this, and I doubt that anyone else on this list does, either. This is problematic. How can a change of this magnitude be made without the permission of its endorsers? How can endorsers be made to say something that they never endorsed? This is deception at its worst. 2. By what procedure was the statement amended? One would think that such a change would require a proposal to and ratification by the governing committee of the BNC. However, there is no evidence that such a procedure was observed. Lacking evidence to the contrary, we must conclude that it was amended unilaterally by someone with control over the website. 3. Were endorsers like al-Awda consulted or even notified about the change? Again, in the absence of evidence to the contrary, it appears that the change in language was introduced in the most surreptitious way possible, so as to avoid notice. One is reminded of the way the British territory of Gibraltar was enlarged by moving the boundary stones at night. 4. What was the reason for the change? Obviously, Omar Barghouti is entitled to his views. Perhaps he “is genuinely convinced that the ‘Zionist colonization’ of ‘all Arab Land’ applies only to land invaded in June 1967. However, is he the one behind the unauthorized changes in the BDS mission statement? This is a question that needs to be answered, and I believe that the similarities between his statements and the amendment of the BDS mission statement justify the asking of that question without prejudice to the possibility that a satisfactory explanation might exist. Justice must presume innocence until proven otherwise. Finally, according to Gilad Atzmon, some Zionist right wing sources name George Soros and his Open Society Institute as helping to fund BDS and some of its member organizations. We know that Soros is a “soft” Zionist and wants to preserve a Jewish state. Is his funding or that of any other funding organizations a reason for the change in the mission statement? A full disclosure of funding sources and amounts, as well as any and all conditions of funding is needed. In addition, the use of those funds, including line item amounts, is needed in order to demonstrate accountability. I again wish to express my sorrow at bringing these matters to your attention. I hope that my concerns are unjustified. However, I also hope that you will agree that this is an issue that must be addressed. Yasser Abed Rabbo and Yossi Beilin, the signatories of the Geneva Initiative, for example, believe that “the only solution to the Israeli-Palestinian conflict is the establishment of two-states.” And, in what sounds like a warning, the latter adds that the window for a two-state solution will not be available indefinitely and Israel will be forced to deal with the “demographic threat” imposed on it by the Palestinians in historic Palestine. In both of these documents, therefore, Israel would appear to have been confirmed as the “state of all the Jews” and never “the state of all of its citizens”. The logic of separation implicit in these documents implies some fundamental contradictions and begs certain serious questions. “When Mashaal said he was not seeking re-election, a message was sent to him from the movement’s leaders, unanimously asking him to change his mind,” senior Hamas official Salal Bardawil told Ma’an news agency. Khaled Mahaal has been the head of Hamas’s political bureau since 1996, after his predecessor, Mousa Abu Marzook, was arrested in the United States and imprisoned there for two years on suspicion of terrorism. In 1997, the Hamas leader became the target of an assassination attempt by the Israeli intelligence service. Mossad agents posing as Canadian tourists injected him with poison on a street in Amman, Jordan. They were later captured by Jordanian authorities. Jordanian King Hussein demanded that Israel hand over the antidote to save Mashaal, who was in a coma. Under growing political pressure and with US President Bill Clinton’s intervention, Israel did so, and its agents were released. The date of the election of the next Hamas leader remains secret. Ismail Haniyeh, the group’s leader in the Gaza Strip, and Moussa Abu Marzouk, who headed Hamas in the early 1990s, were the top candidates to replace Mashaal, a source told Reuters. OCCUPIED JERUSALEM — A UN report said that the occupation authority is continuing their attacks on Palestinian civilians in the occupied West Bank since the beginning of the current year. The report issued by UN Office for Coordination of Humanitarian Affairs in Palestinian territories OCHA revealed that the occupation has razed 465 Palestinian structures in the West Bank, including 136 houses, since the beginning of 2012, at the rate of 13 buildings per week compared to 12 buildings per week during the previous year. 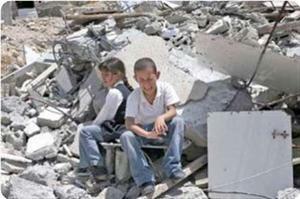 According to the report, 676 Palestinians were displaced and rendered homeless as a result of these demolitions. OCHA also reported that the occupation forces issued an order to seize six dunums of land in the village of Khader in the city of Bethlehem, South of the West Bank under the pretext that the land belongs to the occupation, and confiscated also 200 square meters of Palestinian land located near the Ibrahimi Mosque in al-Khalil city. The UN organization’s weekly report added that the Israeli occupation forces handed over a new military order to confiscate 647 dunums of land belonging to eighty Palestinian families in the villages of Awarta and Burin in Nablus. The Israeli army has ordered two weeks ago a halt to construction and repair works on 17 Palestinian structures in Khirbet Irza, located near a closed military zone in Tubas. According to OCHA’s report, since 1967 the occupation army announced the allocation of nearly1 8 per cent of the occupied West Bank’s land for the establishment of closed military zones used for training its troops, which resulted in dramatically reducing the area of land available for housing for Palestinians. Russia’s Ministry of Foreign Affairs gave USAID until October 1 to shut its doors in Moscow. This is an excellent decision by the Russian Government. And Washington’s immediate and virulent reaction only confirms that Russia is right on target. The New York Times next morning on the front page cited American officials who “quickly pledged to maneuver around the Kremlin.” Even before the public announcement, on Tuesday 18 September, US Ambassador to Moscow Michael McFaul and USAID leadership met with their Russian partners. Grigory Melkonyants, deputy head of the Golos Association – one of the top recipients of USAID funding – confirmed after the meeting that the agency is “not going to leave Russia completely” and they are “brainstorming” about how to reorganize. In the meantime, Ambassador McFaul announced that “it will take at least a year” for USAID to exit Russia, according to Bloomberg News. Brainstorming on how circumvent the Russian government’s decision – instead of how to pack up faster – is only one more demonstration of Washington’s utter disrespect for another country’s sovereignty. Indeed, there are a number of ways in which USAID can maneuver around its predicament. Funding can be channeled directly from USAID headquarters in Washington to its Russian beneficiaries – no need to go through a Moscow office. USAID funding can be redirected through a great number of other US institutions, beginning with the National Endowment for Democracy and its four mandated institutes; private funds such as MacArthur, Soros’s Open Society Institute, or Freedom House; universities’ Russia programs, etc. To hide the American connection, USAID can channel funding through their partners in Ukraine, Poland or Georgia – for their very active operations in the Caucuses; in this case the money entering Russia will be Ukrainian, Polish or, God forbid, Saakashvili’s. In October last year, USAID signed an agreement with Cisco Systems on joint 50/50 funding of Cisco Networking Academies for Public Service Program. Cisco and other major US corporations may continue running USAID programs. A year ago Michael McFaul announced an initiative to create a new US$50 million fund, essentially an endowment for a private foundation established under Russian law for Russian civil society groups. Washington may use any combination of these and other possibilities. One way to put an end to USAID activities in Russia is not only to close their Moscow office, but to insist on shutting down all USAID programs and funding for Russia. This is American taxpayers’ money – give it back to the American people, use it to help them pay mortgages instead of throwing families out of their homes. Obviously, USAID cannot be allowed to stay in Moscow beyond the set date. This delay will only serve to build up additional infrastructure – people and organizations – to run operations remotely. The main lament of the Western press has been about how hard USAID closure will hit the sick, disabled, mothers, newborns and other children that the agency helps. Well, let’s take a look at USAID leadership to see how well they are suited for healthcare services. Earlier North served as Senior Deputy Director of USAID’s Afghanistan and Pakistan Task Force, and helped launch a presidential initiative to support Mexico and Central America in battling organized crime and drug trafficking. In Washington, Assistant Administrator for Europe and Eurasia until last year was Douglas Menarchik: a 26-year career US Air Force officer, Vietnam veteran with 211 combat missions, assistant for terrorism policy at the Pentagon, where he developed the Defense Department’s Strategic Plan for Combating Terrorism, military advisor to the vice-president of the United States with a portfolio including terrorism and low intensity conflict. Earlier Menarchik was instructor at the Air Force Special Operations School, teaching combating terrorism and counter insurgency. But that’s not all. If you check Charles North’s bio on USAID site, you will see a new “updated” version that excludes his National War College stint. However, a cached copy of his true biography is still available – and this snapshot shows the page as it appeared on September 14, 2012. Someone was cleaning house a few days before the public announcement. Enough tales about healthcare dispensed by US military and national security cadre. USAID – out. Russia must take care of its own civil society, ill and disabled by itself instead of outsourcing it to Washington. Russia’s shutting USAID operations is also an excellent example for any other country where USAID operatives still work on “winning hearts and minds” of the local population. I had the impression from everything he said and the way he said it that his lordship was in no doubt that he was speaking from the top of the moral high ground. Up there his words may sound fine but they are out of touch with one of the most important aspects of reality. The vast majority of Jews refuse to acknowledge that a terrible wrong was done to the Palestinians by Zionism, the terrible wrong being, and only starting with, the creation in Arab Palestine of a state for Zionist Jews mainly by terrorism and ethnic cleansing; a process which saw upwards of 700,000 Palestinians dispossessed of their land and their rights. In that light, how can the chief rabbi claim that on the Day of Atonement Jews “apologize for all the wrongs we’ve done”? Either he doesn’t know that a wrong was done to the Palestinians by Zionism, in which case he sees no need for Jews to apologize for it and seek forgiveness; or he knows that a wrong was done but cannot, dare not, say so. If there is ever to be a peaceful resolution of the conflict in and over Palestine that became Israel, the process to bring it about will have to be kick-started by a significant majority of Jews everywhere acknowledging (1) that a terrible wrong was done to the Palestinians by Zionism in the name of all Jews; and (2) that the wrong must be righted. In the view of this goy (me), Days of Atonement which ignore the need for Jews to be honest with themselves about Zionism’s crimes in Palestine are nothing but Jewish theater.